As some may have noticed over the last week, the full Last Airbender toy line has begun to make its way into retail stores across the country, most notably Toys R Us. 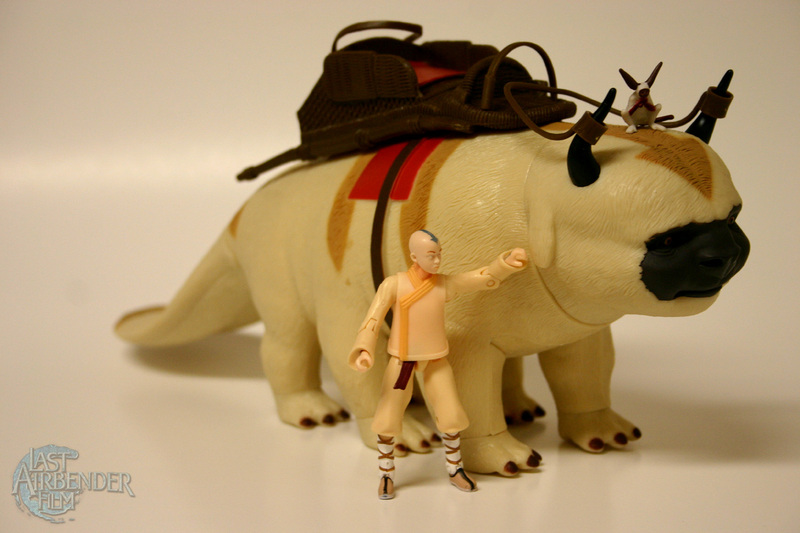 Produced by toymaker Spin Master, the line features five 3 3/4″ scale figures, deluxe Appa & Aang figures, and Aang’s Battle Staff & Ultimate Airmaster roleplay toys. Bite-Sized Benders Coming in June! As we get closer to the release of The Last Airbender the goodies keep piling up for Avatar fans. Over at MTV.com there are a plethora of images highlighting the beginnings of a magnificent set of action figures based off of the theatrical release of The Last Airbender coming this summer. “We worked very closely with M. Night, the rest of the Paramount team and our in-house design team, along with our partner Spin-Master, to come up with the right assortment, the right size for these action figures and make sure we we had representation of all the nations within the ‘Arbender’ series,” said Nickelodeon’s Lourdes Arocho. Along with the images came this video giving a sneak preview of the action figures and a migraine inducing mispronunciation . The Last Airbender toy line will be released in three waves. Wave 1 will arrive in stores on June 1st. Wave 2 will hit shelves closer to the July release of the movie.The final wave is scheduled to be released nearer the holiday season. During Comic Con ’09, Del Ray Manga a division of Random House announced they will be releasing a Manga based on M. Night Shyamalan’s The Last Airbender. No release date has been announced yet. Dave Roman will be writing it and Nina Matsumoto will be creating prequel art. Coupled with news of a new toy line just last week based off The Last Airbender, this gives Avatar fans even more to look forward too. According to toy industry news website, Playthings, Spin Master has been named the worldwide master toy licensee for Paramount Pictures’ The Last Airbender. Using “innovative technology that will enable fans to live out their most memorable moments from this epic film,” Spin Master will produce a comprehensive line of products including action figures, vehicles, and playsets. Adam Beder, Spin Master’s vice president of licensing, had this to say about film and the deal.